A quick read with high ROI. This will turn anyone into a culture builder, anywhere in the organization. A must read for anyone contemplating starting up a new business and for CEOs and leaders of established corporations. Combines storytelling with evidence-based content in a solid organizational change approach. Never before has an author so cleverly balanced pragmatism with optimism to describe organizational norms as opportunities for personal empowerment. The convergence of in-depth analytical research and practical everyday application. Summarizes decades of research on culture and behavior, yet light-heartedly reminds us that it all begins with ME. In my thirty plus years as a trainer and consultant to leaders in a variety of companies, I have been constantly asked to recommend books that could help someone be a better leader or manager. Before now there has not been a single book that captures what I consider to be most, if not all, the essential keys to success. I have used these tools, taught these tools and, to have them all in one place, it is like getting a handbook to professional and organizational success. If work feels like you’ve been parachuted into the jungle and are expected to organize a revolution among the people you meet there, this is your operations manual. This book not only puts the power back to the employees, but also takes them through a step by step process to achieve the workplace they want. Creating a culture within an organization is not a trivial matter. 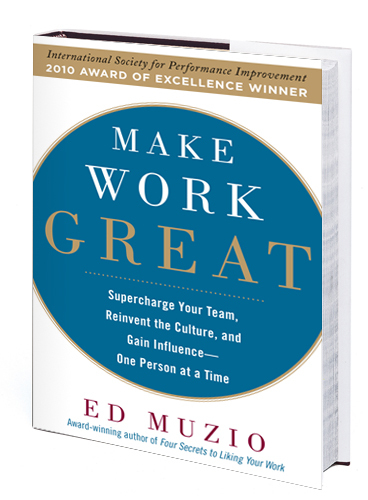 Yet with this book, Ed provides clear and concise guidance on how to crystallize out the optimum culture, in a highly-readable and enjoyable work.